I am excited and up before dawn to watch The Royal Wedding. I typically watch the major American networks, but today I am tuned in to the BBC. In considering which network would have the best coverage—my bet is on the hometown broadcasting network. The BBC will point out the British traditions, celebrities, and identify the fashions paired with those striking hats. Let’s get on to the food. These recipes are simple and easy to make and most importantly they can be made ahead. The quiche however was prepped in advance, combined and poured into the pastry for baking this morning. 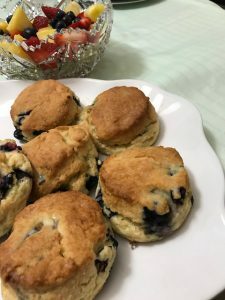 I am serving up my version of the wedding brunch with recipes that are old, new, something borrowed and blue. Though I’ve seen plenty of weddings large and small this wedding is a true blend of traditions, family, and cultures. This couple is really showing us the true meaning of a global world. Blueberry Scones with Honey-Butter Glaze. Pre-heat oven to 425 0 F. Stack two baking sheets together and line top with parchment paper. Arrange oven rack to upper third position of oven. Put lemon juice in a 1-cup measuring cup, pour in half and half and let stand a few minutes to make soured cream. In the bowl of a food processor, with slicing blade, add flour, sugar, baking powder, salt, and baking soda, blend briefly. Add butter and pulse to make a coarse, grainy texture. Pour flour mixture into a large bowl and make a well in center. Add egg, vanilla, and enough soured half and half to make a soft but firm dough. Gently fold in frozen berries. Knead briefly on a lightly floured work surface, adding more flour, if needed, to make a firm dough. Pat out to 1-inch thickness. Cut into rounds and place on prepared baking sheets. Bake 16 to 19 minutes or until scones are lightly browned. In microwave oven, heat honey and butter in a liquid measuring cup until mixture is simmering, about 1 1/2 minutes, stirring after 45 seconds. Brush scones lightly with honey-butter glaze as they come out of oven. Let stand on baking sheets. Repeat with more honey-butter glaze, about 15 minutes later.